Fire equipment at the firehouse, owned by Joint Fire District and volunteer fire dept. You can't run a fire department without some good equipment. Then again, the best of equipment is worthless in an emergency if you don't have someone trained to operate it properly. The Pleasant Hill-Newton Township Fire Association provides the man-power to operate the equipment provided by the JFD. The business meeting for the fire association is the second Monday of each month. The association has it's own officers and funding. 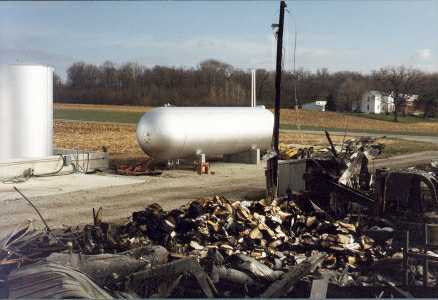 New Unit #6, this 1000 gallon vacuum tanker truck replaces the above truck in 2001. THANK YOU TAXPAYERS! 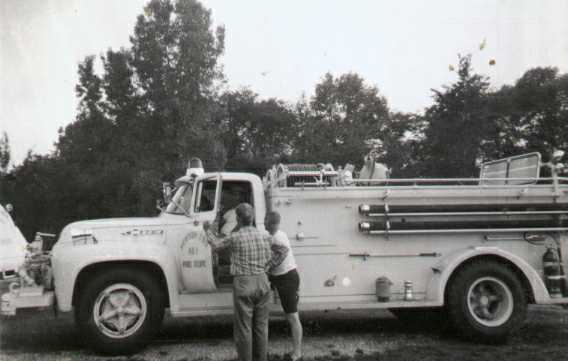 Unit #4, a 1974 Chevrolet Step Van, used for heavy rescue, transportation of supplies, equipment, and personnel, equipped with PTO powered generator. This truck was built by the department from an old bread truck. It's equipped with a PTO powered generator and can really crank out the juice! Very handy for lights at fire scenes, auto accidents, etc. It also has an on-board coffee pot that makes it a central unit for those larger fires where someone has to stay behind and watch for rekindles. Our portable cascade tanks (high pressure air used to refill air bottles) are also in this truck along with our rescue tools. This is probably one of the most used vehicles we have. 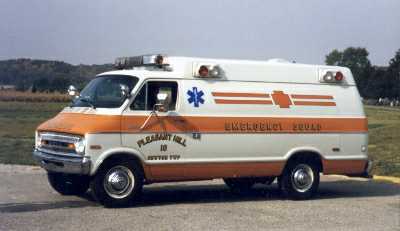 It used so serve as an ambulance too. It's currently undergoing renovation to make it more useful for the work we expect of it today. 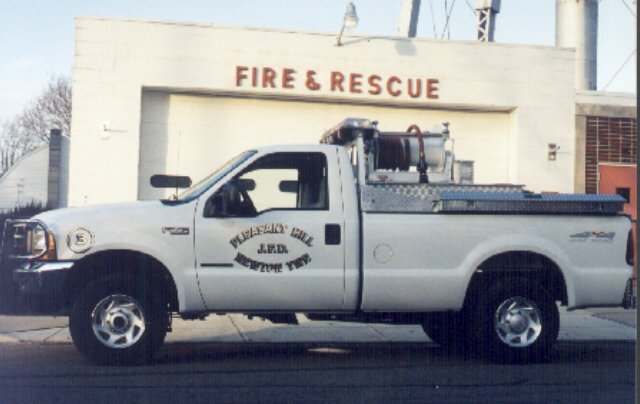 Unit #3, a 1998 Ford all wheel drive grass truck equipped with a slide-in pump and 300 gallon tank. Unit #32, a 15 foot motorized boat for river rescue. 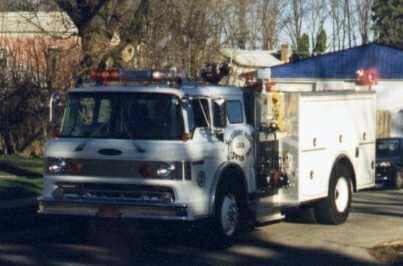 Unit #14, a 1994 Ford-Braun Modular rescue squad. 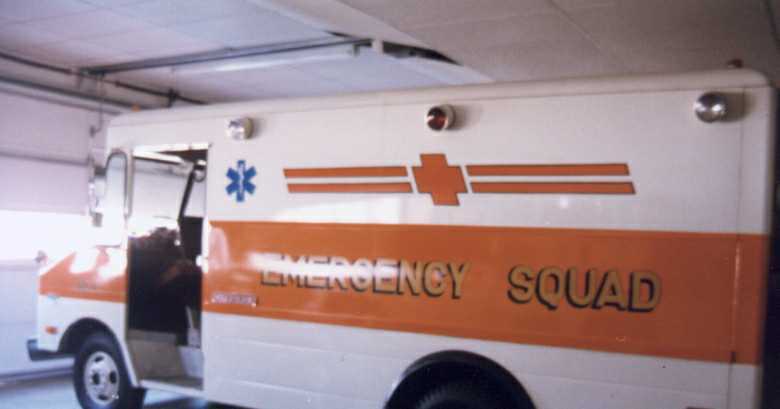 Unit #15, a 1982 Ford-Braun Modular rescue squad. Here are a few pictures of our "first out" truck. It's our Unit #2. 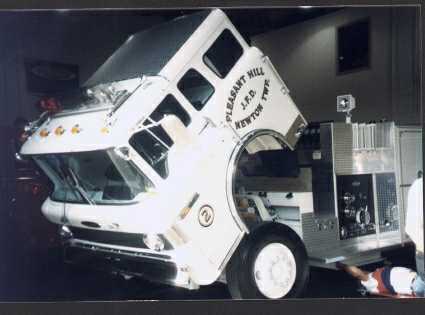 These pictures were taken when the truck was first purchased by the department. Most of them were taken while the truck was still at the factory. One doesn't even have our name on it yet. Click on the thumbnail for a larger image. This is a picture of Rescue #16. This was a memorial squad in honor of a fireman who died while responding to a call. We were told to disregard the run but it was too late. He'd had a heart attach when entering the firehouse. We retired the squad from our service however it seemed appropriate to pass the squad on to someone else to use. It is currently in service in Kentucky where we hope it will continue in the service of helping others. 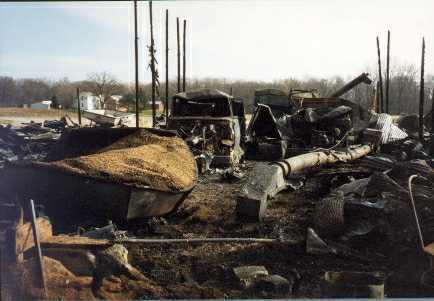 The following are pictures of one of our worst fires. This was a barn filled with equipment. It was also plumbed with propane as it was used as a shop and drying area. Notice the huge propane tank in the background. This was a major concern to us the night of the fire. See the white house in the background? 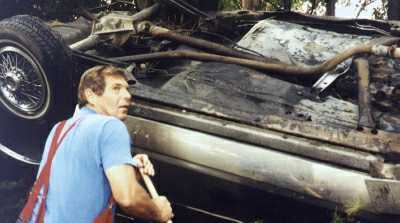 It was hit by an alternator that was blown off a truck in one of the explosions that occurred during the fire. Want to see something else impressive? 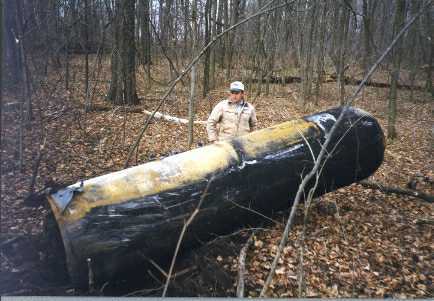 Check out the pictures with the tank in the woods. 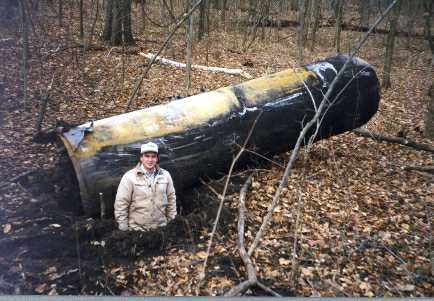 The end of this tank blew off in an explosion and the tank flew for about a half mile before driving through some trees and crashing into the ground. Check the guy standing in the hole! It's a good thing this tank didn't land on someone's house. A person who saw the tank in the air said it looked like "a Volkswagen on fire flying through the sky." Here are a shot from an unrelated fire. 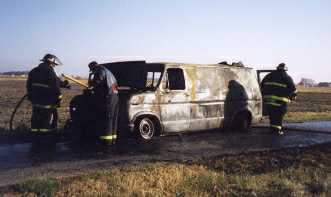 In this case a commercial van caught on fire. 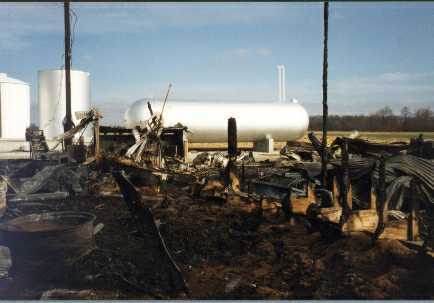 It was fully involved when we rolled up on the scene and we were informed that there were both propane tanks and oxygen/acetylene tanks on board. We didn't get very close to this one! We cooled things off with the deck gun first. You can see the hole in the roof of the van where a propane tank blasted off. We never found the tank. 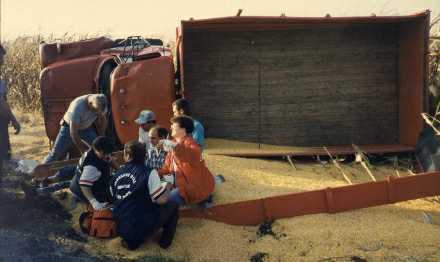 Here's a couple of shots from a grain truck that rolled over. The country road it was on just wasn't wide enough for both the truck and the car that passed it. 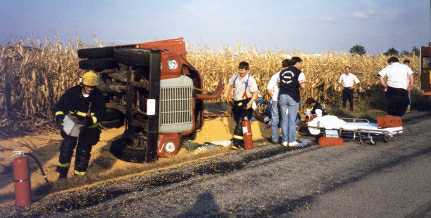 Here's one of our retired Assistant Chiefs at the scene of an auto accident. Here are a few shots from a couple of accidents. Follow this link.